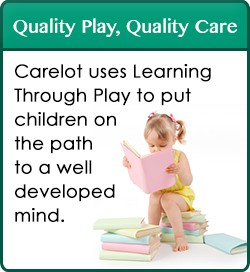 We have developed a program to meet the social, emotional, cognitive and physical needs of each child. Our main goal is to provide your child with the desire to learn, a positive self concept and the social and pre-academic skills needed to effectively participate in a group setting. The teachers in the program are kind, nurturing and willing to work as a team with both staff and families to create a stimulating environment for learning. Our schedule is well balanced and assists the teachers in effectively carrying out the instructional activities as well as providing the necessary supervision and interaction during child directed activities. Daily schedules include circle time, learning centers, art and sensory, music and movement, outdoor play, science/cooking, computer skills and much more! We also offer a morning preschool program from 8:45am to 11:45am. You have the option of 2, 3 or 5 days a week. Our rates for this program are $20 per day!